Last year, a video of a father crying for joy when learning of his wife’s pregnancy went viral, touching hearts around the world. 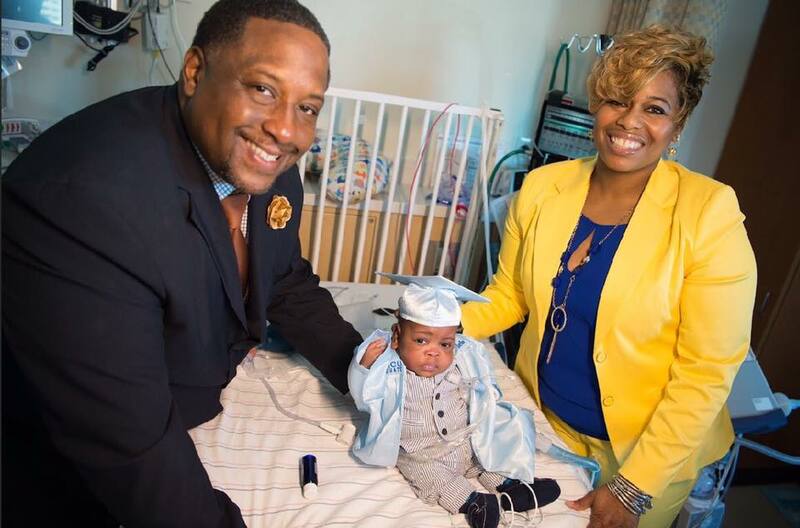 As reported by NewsOne, after 17 years of trying to have children — including four miscarriages and a stillbirth at six months — Arkell Graves and Dana Griffin-Graves were beyond thrilled to be expecting a child and to have made it to five months gestation. They also had a son through adoption. However, just weeks after sharing their video, Griffin-Graves went into preterm labor and their baby boy Kaleb was born, weighing just 13 ounces, on October 20, 2015. Griffin-Graves was experiencing extremely high blood pressure, which led to the early arrival of Kaleb. She was told her life was at risk and that she most likely wouldn’t survive, but she did, and so did Kaleb — even though doctors only gave him a five percent chance of survival. Since he was born so young, Kaleb struggled with lung issues, and his parents knew he would need to spend a few months in the NICU. After six months in the hospital, the family was finally making plans to go home. Kaleb had moved up to a non-invasive ventilator and had successful surgery to repair a hole in his heart, but then his health took an unexpected turn. Kaleb needed a tracheostomy tube placed in his throat to help him breathe, and he also had to have a gastronomy tube placed to help him get the nutrients he needed to grow. It would take another six months before Kaleb would be able to go home with his parents and big brother Keelyn. He made it home just a couple of weeks shy of his first birthday. To celebrate the occasion, his tearful and grateful parents took photos of Kaleb in a cap and gown, marking his graduation from the NICU. The now 13-pound boy arrived home on October 11, 2016. In order to ensure the transition to home was successful, Kaleb’s parents had to learn how to properly care for their son away from the doctors and nurses of the NICU. Kaleb received a limo ride home from the hospital as part of the big celebration. And on his first birthday, he celebrated by going live on Facebook so all of his fans could wish him a happy birthday. His parents say that Kaleb is thriving at home, and they have plans for many more graduations in his life.